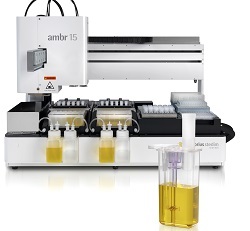 The Ambr 15 fermentation system, just introduced by Sartorius Stedim Biotech (SSB), is an automated micro bioreactor designed to enhance microbial strain screening. The system has been designed to meet the requirements of microbial fermentation, and consists of 24 single-use stirred micro bioreactors of 8-12ml working volume. SSD says Ambr 15 offers parallel processing and walk-away control, providing fermentation scientists with efficient, consistent results from an enhanced early stage screening platform. The system is designed to deliver high oxygen transfer rates with rapid pH and feed additions, and is useful for assessing the effects of different strains with microbial cultures. Each micro bioreactor is fitted with an impeller and pumped lines for base and feed addition, enabling tight pH control and a semi-continuous feed supply. Being single use means there is no cleaning and sterilisation time, decreasing turnaround times between runs and boosting laboratory productivity. The pH range of 6-8 is said to be ideal for E coli and other cultures, and the device measures pH and dissolved oxygen (DO) every 12 seconds. Dr Barney Zoro, Ambr product manager at SSB, explained: “Scientists may try to model microbial fermentation and screen microbial strains using shake plates and flasks, but these are not able to achieve representative cell densities, and do not allow monitoring and control of pH or DO. “We developed Ambr 15 fermentation and have data showing system consistency, repeatability and predictive selection of strains. “This demonstrates that the system is an excellent tool for enhanced screening applications”.